If you’ve read the previous updates, then you know that I’m not actively working on site #2 right now as I’m choosing to focus on growing site #1. So, it’s been about six months since I’ve posted any new content on that site. This means that the earnings you see since December 2016 are completely passive due to my purposeful negligence on the site. I have been adding new content to site #1 and I’m choosing to focus on money posts instead of informational content. Why? Two reasons – 1)Adding new money posts is an easy way to boost the income, 2)Due to my high number of informational posts my current earnings per visitor (EPV) is painfully low at just $0.09 per visitor for May. For site #1, I have also been focusing on doing outreach to gain links via guest posting. That is going well and I’ve managed to add a total of eight new guest post links pointing at the site in May. What’s interesting to note here is that the number of keywords went down for site #1 and up for site #2 (see last update’s numbers). I can also tell you that for site #1 I lost a featured snippet in late March for a good ‘best PRODUCT’ keyword that cause a dip in traffic and earnings. So far, I’ve been unsuccessful in reclaiming that featured snippet. 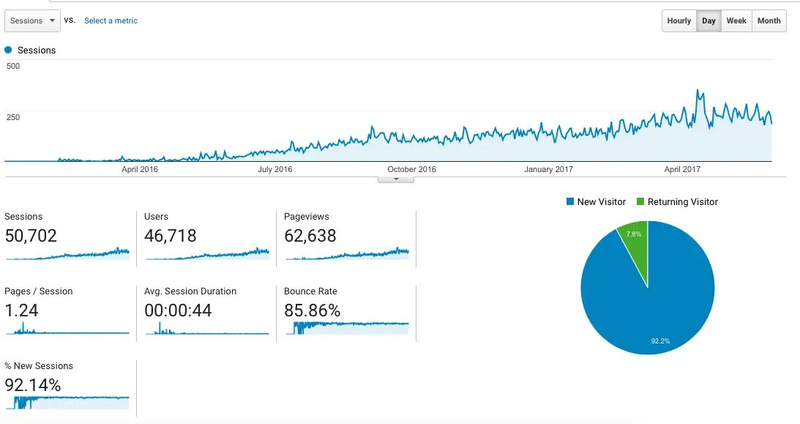 I’ve had some requests for more data on the two case study sites, so I’ve taken screen shots of each one from Google Analytics. What you see below covers the period of Jan 1, 2016 through May 31, 2017. As you’ll see below, the Amazon commission decrease for my product categories is taking its toll on my income. You can also notice the drop in site #1’s income when I lost the featured snippet. Quite the decrease, eh? While these numbers are decent, I won’t lie and say that I’m happy with where site #1 is right now. Though I am happy that the commission decrease doesn’t seem to have had much of an effect on site #2’s income. Though I’m not happy about where site #1 is at with it’s earnings (especially considering my income goal), I’m not really all that worried about it. Site #1 still has around 70 product categories for me to make money posts about, so I’m still confident that I can get the earnings up. Plus, I’m working on getting new backlinks for the site, which will help boost rankings and income. Mostly I’m just annoyed that it’s going to take me a bit longer to reach my income goals for the site. And, thus far, I’ve had little to no luck with my attempts as using other affiliate programs on site #1. So, I’ll still be tweaking that and seeing if I can get some diversification going on. Though it’s really boring, my focus right now is on adding more money posts to site #1 and getting more “white hat” backlinks for site #1. And, I keep testing new changes on my money post that lost the featured snippet. Hopefully one of the changes I make will help me get it back soon since my highest trending month for it is approaching. Honestly, I’d really love to hit my income goals sooner rather than later cause I really hate the niche of site #1 and don’t want to work on it! I’m also considering starting a brand new site in a different niche with my students that is completely white hat from the start. If you’re interested in that follow-along, then you’ll want to get on my email list (link in sidebar) to be notified when I open my course again (sometime in the next couple of months). Students who are in my Insider Facebook group will see the actual live site and everything that I do with the site from the start. Currently I’m only offering access to the Facebook group for students in levels two and three of the course. Got something else you wanna know about the two case study sites above? Let me know in the comments and I’ll see if I can include it next time (or just give you the answer below). P.S. A quick shout out to Tim Gouw for this CC0 license photo at Pexels that shows just how I feel about site #1’s income levels! Congrats! To me, both of your sites look great in terms of traffic and earnings, both of them likely to increase in the coming months. May i ask you something in the motivation standpoint? How do you keep yourselves motivated to write this many articles (other than the ones outsourced + you have your own sites in parallel)? How many hours do you work on your site(s) per day? Would you mind sharing your workflow? I normally work at least 6 days/week most of the time. I get started by 11am and end by 6pm (with breaks for lunch and coffee). Sometimes my “work” is listening to industry podcasts and reading SEO articles to keep myself educated on the latest things in the industry – so I’m not creating content or sites every single day. A few months ago I created a system where I work on my five most important sites as my core focus. (I have almost 30 sites earning, but I focus on two I’m closest to being ready to sell and three that I’m growing for the long term). I also have 3 sites that I work on with partners. I have a list of keywords for each site and I start with one site, get content up, then move to the next site, and so on. Some of the sites are 100% outsourced so all I’m doing is formatting and posting content, others I prefer to write on own. Basically, I have each site written on an index card and when I sit down at my desk, whatever card is on top is the site that I work on, then that card goes to the back when I’m done. It’s a simple system, but I find that it’s what works best for me cause I used to get overwhelmed as to which site was most important to work on when I sat down. Oh Shawna, that was impressive.. TBH, this was the kind of reply that I desired for, but i was so doubtful about that since you have no reason to spend your time explaining it all. This is my first time reading your work and I’m so in love with you or your work, not sure. 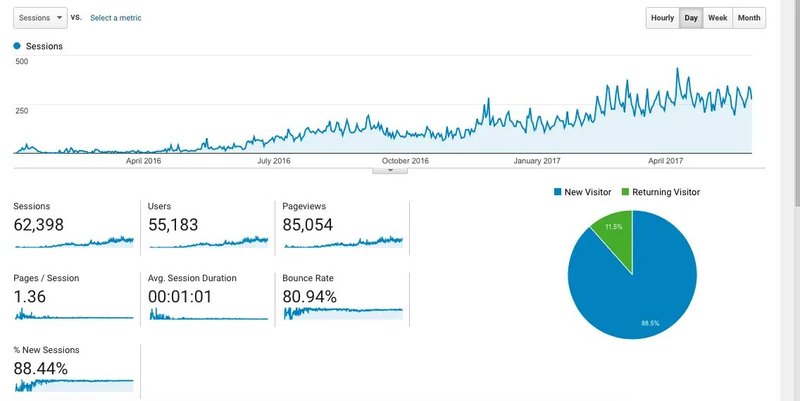 My first site is struggling but reading this post has renewed my determination and I don’t know why, so Thank you! PS: I cannot afford to pay for your consulting service right now but the moment I have cash to spare, I ‘ll be reaching out to you. Hi Sunday, Thanks for the kind words! Working on sites can be de-motivating since it takes a while for them to start earning a lot of the time. Keep adding content and working on it, and eventually you should start to see some results. And I got your email and will let you know when my course re-opens. I think it will probably be the better value for you instead of the coaching. Best of luck and talk soon! Great article. Happy to see how the gurus keep on it because it motivates a beginner like me to keep on it for the long haul. Hi Daniel, happy to see that I’m helping to keep you motivated! It can be a grind for sure, but it’s all worth it for the freedom. You are doing absolutely great Shawna! I was just searching for someone who is doing a case study on amazon (currently) and saw yours. Thank you for sharing. The scholarship links is what I will be looking to implement on my own niche site case study.